Au Dela Plongee Dive Centre is located 43°20'32"N 05°15'32"E in the western callanques of marseille. Our dive center purpose all kind of PADI & CMAS training course. We have a range of the latest equipment on display and test at our Shop in Marseille Provence We also provide Several of the most beautiful dive in the mediterranean sea.Marseille is also an the wreck area over 80 wreks are available. The islands in rad of Marseille are very numerous, and in fact, each of them is a diving site. From the phenician or roman galley to the last war or begining's century cargo boat, the indexed wrecks are numerous. Curiously there are not or very few wreck from the middle period; excepted vestiges of "le grand saint Antoine" who brung the 1720 pest epidemy in Marseille. But it's not just about diving, it's about people you will meet and on who you can trust! Au Dela plongée is one of the Marseille's leading providers of PADI diving courses. To find out more information regarding our PADI diving courses please refer to our specific section Diving course. PADI, the Professional Association of Diving Instructors, with 4300 dive centres in over 175 countries is the world’s largest recreational diving membership organisation. At Au dela plongee we teach the full range of PADI courses up to Instructor level directly in the wild blue mediterannen sea. Au Dela plongée’s Commercial Diving division began operating 4 years ago. Although much of our work is based along the west coast of "Rade de marseille" in the heart of the "Callanques". 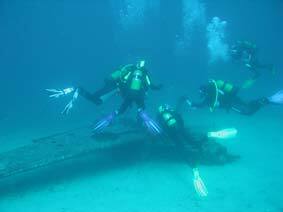 However, We do not just provide PADI diving courses. Our retail shop carries the complete range of scuba diving equipment and accessories from leading manufactures such as Aqualung, Suunto, Mares, Seaquest, Technisub, Cressi sub . Our scuba diving equipment has been continually developed and refined, and today we enjoy the finest scuba gear the sports diver could wish for, plus of course all the accompanying wet and drysuits, masks, fins etc from all the major manufacturers. If we stock it at Au Dela Plongee, you can be assured of its quality, performance and value for money. We strive to give excellent customer service. It is our aim to bring the best equipment and to show you what is new to the market. All of our staff are Diving Instructors. Contact us today for any further information related to our PADI diving courses or to dive with us right away. Learn to dive with Au Dela plongée – we’ll take you into the amazing underwater world of Groopers , reefs and wrecks . Click here to enter our website and find out more information about our PADI diving courses in marseille.